In its sixth consecutive year, the Jepson EDGE Institute is growing rapidly in popularity and purpose, with an increasing focus on how to translate the theories and practices learned within the walls of the Jepson School into the contemporary workforce. 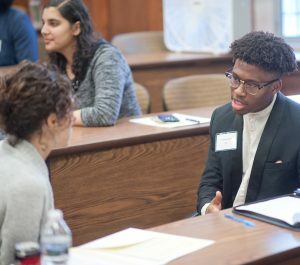 Each year for one day in February, alumni and students convene in Jepson Hall to discuss topics that include interviewing skills, how to give an effective elevator pitch, what it takes to navigate receptions, and tips and stories from endless real-world experiences. With a primary goal to help current juniors learn how to land that coveted first internship, the Jepson EDGE Institute provides a full-day of action-packed practice sessions on everything from answering difficult interview questions to clearly articulating the value of the leadership studies degree. 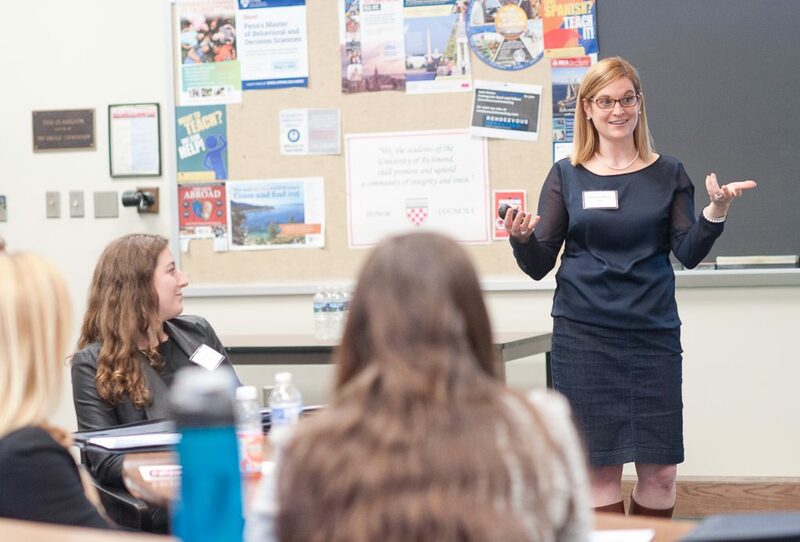 Workshops are designed and led by alumni volunteers, providing an opportunity for students to speak one-on-one with those who have taken the leadership studies degree into a variety of different industries. From healthcare to non-profit, sales, education, government, technology, and more, over 70 alumni volunteers shared their perspectives and lessons learned this year. One of the unique strengths of EDGE is the exemplary involvement we see from our alumni who make this program such a remarkable success. The increasing annual participation is a powerful indicator of everyone’s true passion for the ongoing success of Jepson students and the school. It’s a full-circle endeavor that brings our students and alumni together in such meaningful and impactful ways. “Aside from learning new and relevant ways to articulate the impact of the Jepson Experience, we want students to recognize that they are part of a larger community. A tribe of fellow Jepsonians sharing a common ideal, impacting the world in unique ways, and eager to empower the next generation of alumni.” — Michael Watrous, ’03, Co-chair, Jepson Alumni Corps. The Jepson EDGE Institute is primarily driven by a committee of volunteers from the Jepson Alumni Corps, a group of graduates who range greatly in depth of experience and diversity of professional fields. The committee meets several times a year to reunite with our classmates and foster a deeper connection back to the Jepson School. It’s a commitment that reminds us all why we stepped foot in Jepson Hall as young undergraduates, and ties us back to the purpose of the degree as we engage positively in our communities, continually challenge our own perspectives, and ultimately serve for the good of others. If you’re interested in learning more about being a part of the Jepson EDGE Institute or the Jepson Alumni Corps, please contact Dr. Kerstin Soderlund, Associate Dean for Student and External Affairs: ksoderlu@richmond.edu. Kate Rezabek is the Director of Group Fitness at American Family Fitness where she drives programming and business strategy among all nine club locations. Kate graduated from the University of Richmond in 2002 with a B.A. in Leadership Studies and Rhetoric & Communication Studies, and from Lehigh University in 2004 with an M.Ed. in Educational Leadership. Her professional background blends experience in education, business development, employee training and engagement, and fitness. She lives in Richmond, Virginia with her husband Joe and two sons, Ryan and William. Follow her on Twitter and Instagram (@KateRezabek) and comment on her blog, katerezabek.com, where she writes about leading with integrity in business and in life.